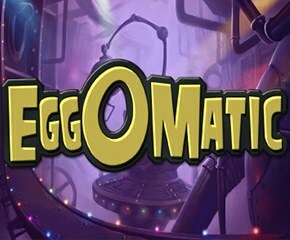 Eggomatic is a new video slot from the stables of NetEnt. It features robotic chickens and metallic eggs in what seems to be an industrial setting in the background. This slots game has an Autoplay feature to help players spin the reels for a certain number of times uninterrupted. There are interesting bonus features available as well, read on to learn more. Eggomatic has 3 rows and 5 reels with 20 fixed paylines. Before you spin the reels, the players will have to place their bets. This, they can do from the control-panel like paytable below the reels. The “Coin Value” is to the right of the large spin button. The minimum bet is £20 per spin while the maximum bet is £200 per spin. On the reels, you have five robotic chicks of different colours (green, red, blue, brown and pink) as well as five chickens of similar colours as well. The background is an industrial scene with metallic eggs from an Eggomatic machine rolling onto a conveyor belt. The Wild is a Big Blue Wild Chicken icon. • The Expanding Wild Egg: If this egg is caught every icon near it will turn Wild and boost your chances of earning combo wins. 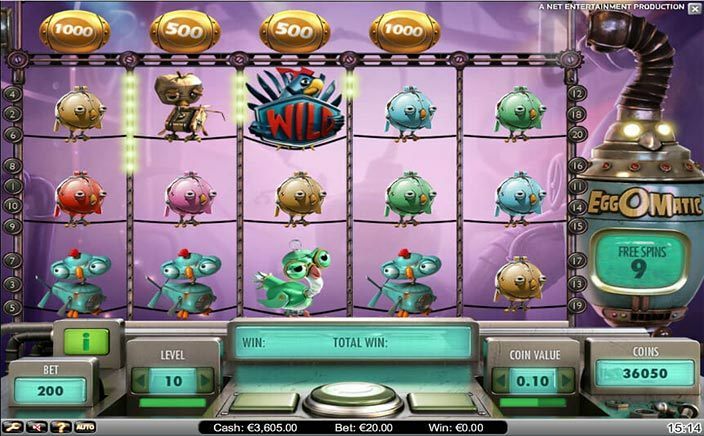 • The Free Spins Egg: You will earn a random number of free spins when you catch this egg. The free spins are earned are between 7 and 50, you can also retrigger free spins during the round. • The Coin Win Egg: You will win coins when you catch this egg. The higher your stake the more coins you will catch. Players can earn between 50 and 2500 coins. There is a Surprise egg that can be produced by the Eggomatic machine. This egg will roll onto the conveyor belt and when you catch the Surprise Egg you will earn any one of the free spins, coin win and expanding wild prizes. This is a well-detailed game with stunning graphics and animation. The bonus features are all interesting and the game can really be played at a fast pace when you use the Autoplay mode.